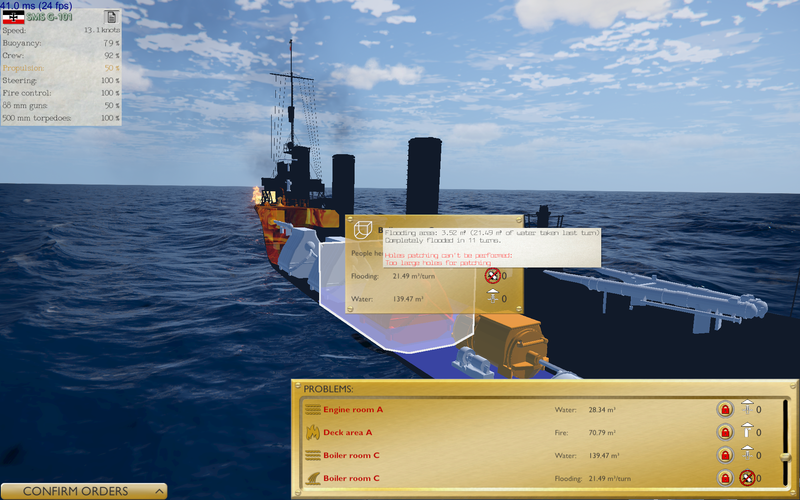 Turn based tactical game about war at sea between British Royal Navy and Imperial German Navy during World War I. 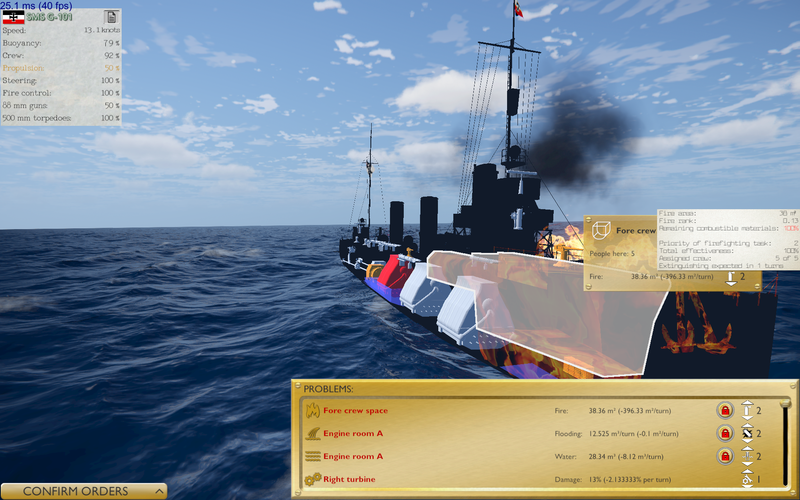 Advanced damage model of ships. All ships are close to their historical prototypes. High influence of visiblity and weather conditions. Damage control system. 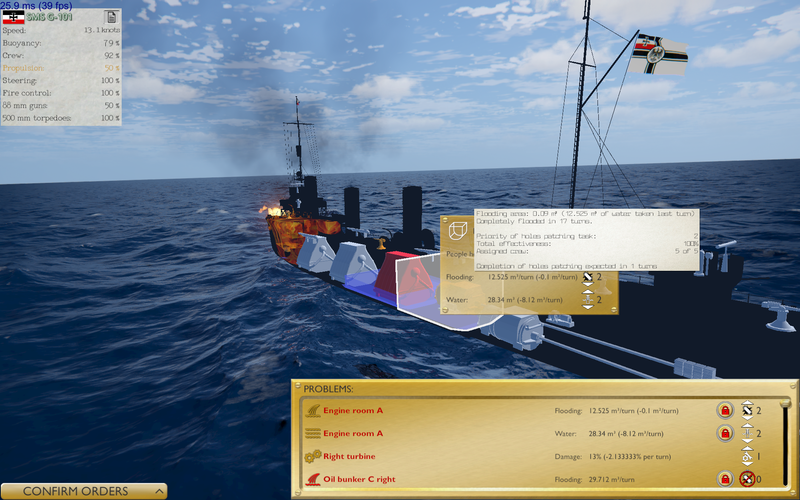 Player can manually manage crew to repair modules, patch holes, fight fire, and so on to prevent ship from exiting battle and sinking. Fleet commander career single player campaign. Keeping ships afloat and combat-ready is the important part of Naval Hurricane game. A lot of bad things can happen to the ships during battle but clever damage control can make ship survive even in very complicated situations. As mentioned in previous articles a special sub-turn exist for damage control. 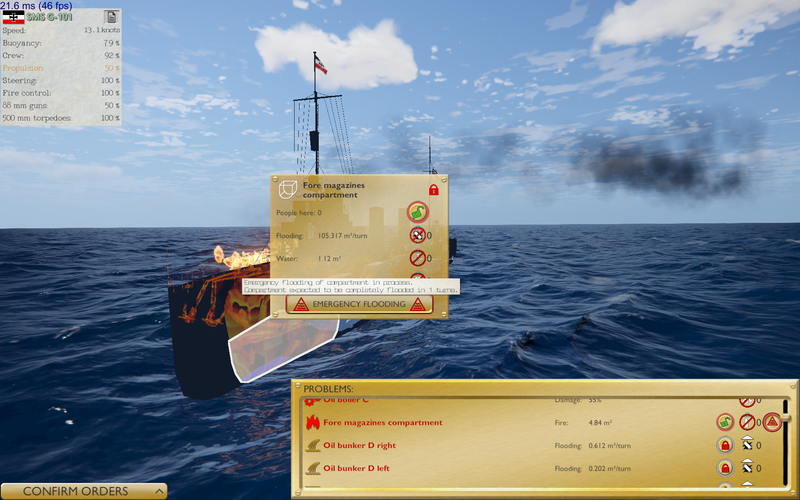 It is optional and appears only when ship suffers from damage effects which can be reduced or eliminated by damage control actions. X-Ray view automatically turned on during damage control sub-turn. ‘Task-priority’ logic used here and key to success is assigning right priorities to right tasks. It is often better to focus on something that you can save leaving other damages untouched as resources of the ship used for damage control are limited. These resources are crew, electricity production, performance of pumping, fire-fighting and emergency flooding systems. They are varying for different ship classes and obviously larger ship has greater capabilities for damage control. Effectiveness of damage control tasks depends on these resources sufficiency. Damage control tasks in the game are following: repairing modules, fire-fighting, holes and breaches patching, pumping, emergency flooding. In addition to them module maintenance tasks exist which are not related to damage control but their priority can be reduced to rebalance consumed resources (crew and electricity if module is electric powered) in favor of damage control tasks. It is best to describe all this in a ‘live’ situation of damaged ship. Below you can see G-101 class destroyer is highly damaged in combat. First of all there is a fire in fore magazines compartment and it is really dangerous. It will make magazines to explode if not extinguish the fire as soon as possible. Common firefighting (crew using fire hoses) will be too slow for such extreme situations. That is why ships have emergency flooding system which completely floods compartment with sea water not giving any room for fire. As you can see in the tooltip in the screenshot below it is very fast and will completely floods compartment in single turn. If player wants to flood few compartments during the same turn performance of emergency flooding system will be evenly distributed between these compartments and flooding will not be so fast. In our situation ship has enough buoyancy as shown in ship status in upper left corner so it safe to flood one of its compartments to prevent magazine detonation. If remaining buoyancy would be low ship may sink in case of flooding magazines compartment and assigning the common firefighting task to magazines compartment is the only possible try to save the ship. But there is a great chance that firefighters will not be able to cope with burning magazines. Another significant problem exists in the middle of the ship with the huge breach from the outside of the oil bunker on the right side of boiler room C. And similar breach also exist between this bunker and the boiler room C so both these compartments quickly flooding. Such breaches can’t be effectively patched at a sea. Moreover, oil boiler C is so heavily damaged so it can’t be repaired at a sea too. So it is better to focus on saving right turbine engine which is not working but can be repaired. Modules repairing tasks only require enough crew but also become more effective in case of sufficient electric illumination. Bulkhead between boiler room C and engine room of right turbine is damaged and water leaks into the engine room. To deal with this problem holes patching task should be assigned to ship crew. Also it is useful to activate water pumping in engine room to ensure engine room will not be flooded before completion of holes patching. Pumping system contains of static pumping tools which not require crew to operate and mobile pumps which are less productive and require crew. Performance of these tools also distributed between pumping tasks in according to their priorities. There is a fire on the deck on bow of the ship and in the compartment just under the deck. No important modules here (bow turret will not work anymore because its magazines will be flooded next turn) but fire can spread on fore superstructure. Fore superstructure have one of ‘conning towers’ (bridge plays role of conning tower in most of small ships) and one of rangefinders on it. 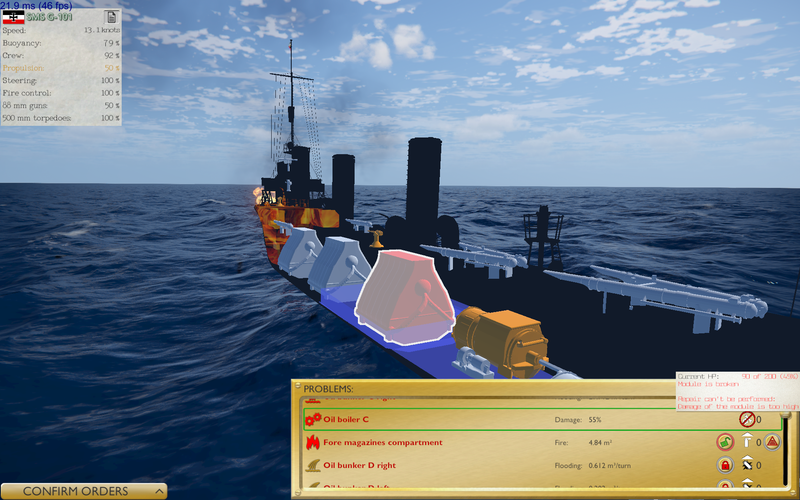 So we assigning firefighting tasks for both the bow deck area and the burning compartment giving greater priority to compartment as it has more ‘combustibles’ in it. Performance of fire-fighting system distributed between all firefighting tasks depending on their priorities. Take a look at the buoyancy value in the ship statistics in the upper left corner. It is only 54% because boiler room C and oil bunker to the right side of it are completely flooded now. Damage control system in the game can look a bit complicated but it can be completely automated if player doesn’t want to dig into it. That’s all for today. Dev blog #3. How ships work. Modules and subsystems. Quick overview of primary subsystems and modules of ships in the game. 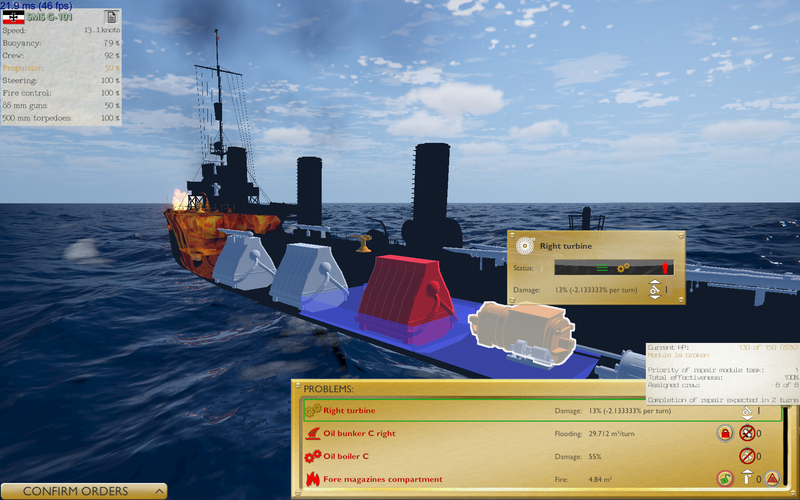 Quick overview of ship compartments model, flooding and buoyancy mechanics in Naval Hurricane game. 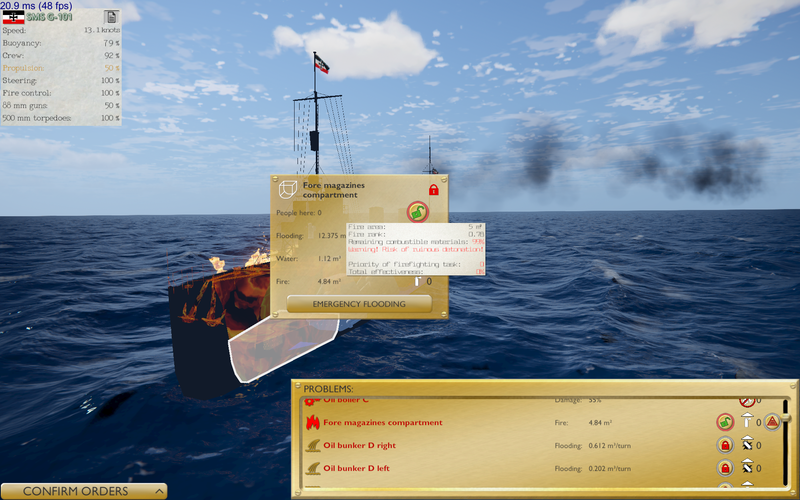 Campaign is like 'admiral's career' where you start with few small old ships (or even single ship) and gain 'reputation points' by performing dynamic quests or 'free hunt'. 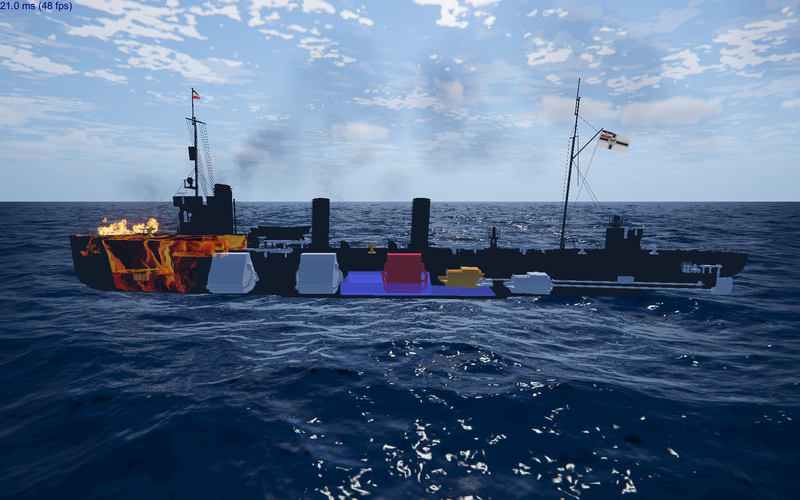 Player does not build ships. They are unlocked for purchase for 'reputation points' based on player level and current in game date. Conquering territories is not the main goal of the game in campaign. 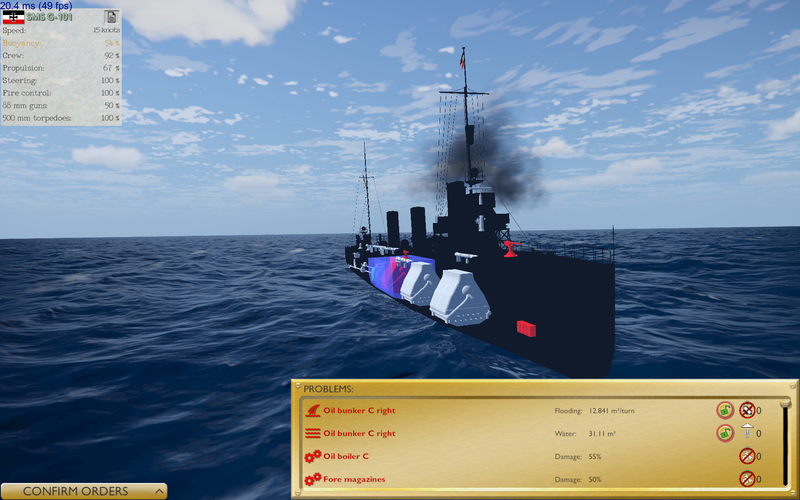 I'm thinking about something like 'strategic balance' which increased in favour of player when destroying enemy maritime trade, capital ships, successfull support of land offensives including landing operations. Unfortunately you may need few extra hands to manage 3 weapons groups of each of your ships in real time :).